Incremint.io – solves the ICO credibility problem with a decentralized escrow system. Using Incremint, ICO Issuers will direct a predetermined portion of the raised funds to be escrowed pending milestones. Upon completion of the ICO, token buyers will vote to authorize a release of the escrowed funds as Issuers complete their milestones. By using Incremint, Issuers show their commitment to good corporate governance practices and their confidence in the business plan that they are marketing. 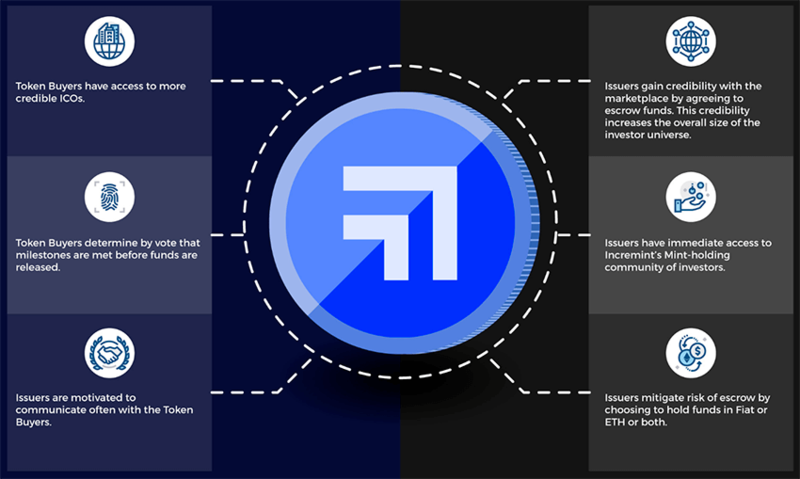 Token buyers mitigate the risks associated with investing in ICOs, resulting in an increase in demand for Issuers. The founders are highly experienced legal and financial experts with extensive track records in complex commercial transactions. We combine practical experience in escrow and financing arrangements with the technical expertise of strategic partners. Incremint believes ICOs will continue to thrive and that the risks of an unregulated ecosystem with little governmental oversight inherent to ICOs can be best mitigated effectively from within the blockchain community. An escrow solution is needed. Existing multiple signature escrow mechanisms rely on the discretion and performance of a person, the impartiality of whom is not always certain, rather than the automated and decentralized collective will of token buyers. This is a serious weakness. Traditional escrow mechanisms are problematic as well in the context of ICOs due to the limited capabilities and unwillingness of banks to deal with cryptocurrencies. Incremint overcomes these critical deficiencies. It is a hybrid escrow product combining the reliability and trustworthiness of a traditional escrow mechanism, with the automation and enhancements of smart-contract voting (“smart voting”) and decentralized blockchain technology. Incremint enables issuers to custom define parameters and escrow a portion of funds raised in their ICO, subject to release when designated milestones have been met and approved by token holders. Incremint is not a middleman. Incremint is a backer-driven self-governance system, professionally administered. Using Incremint, only a pre-agreed dollar amount or percentage of ICO proceeds passes through immediately to issuers at closing. The remainder is escrowed in a combination of crypto and fiat currencies. Issuers determine the split as required by their FX risk policies, and fiat is deposited with a reputable bank. At agreed dates, token holders vote to confirm whether milestones have been achieved, which, when confirmed, automatically causes the release of escrowed funds to the issuers. If an issuer is unable to achieve a milestone, escrowed funds can ultimately be returned to token holders following requisite voting procedures. Voting procedures are structured to prevent manipulation and unfair outcomes for issuers, while affording sufficient and reasonable protections to backers. Incremint supports transparency and fairness after an ICO closes. It incentivizes communication and disclosure from issuers and rewards their achievements. It protects backers and engages them in a project’s success. No other escrow solution being developed, to our knowledge, offers the same functionality and potential as Incremint.